The Chinese maybe known for their discipline but sometimes having too much is dangerous. Two executives from a bank in Shanxi, China have been suspended from work after a video circulated on the Internet showing some members of their staff being spanked for performing poorly in a training class. 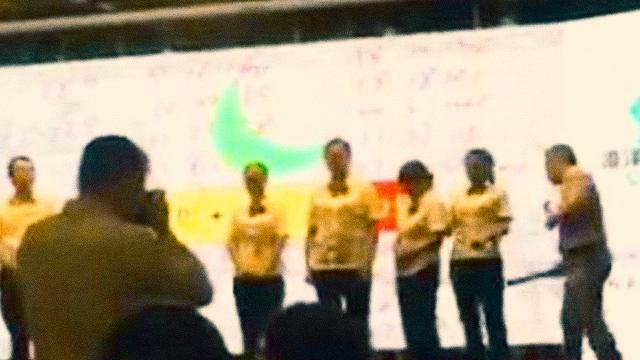 The video, which was caught by a phone and was posted on the Chinese social media website Weibo, showed eight employees of Changzhi Zhangze Rural Commercial Bank standing on a platform in front of hundreds of trainees. A man with a microphone asked why they had ranked last in the exercises. The eight, including four women, uttered reasons such as “failing to make a personal breakthrough” and “inadequate team cohesiveness.” With a stick in his hand, the man said “get your butts ready” and began to spank each of the group in turn. One of the hits threw a woman off balance. Some trainees in the audience can be seen turning their heads away in embarrassment. Another report by South China Morning Post states that 16 other employees were forced to have their heads shaved as punishment. The trainer in the video, Jing Yang, later issued a public apology online for his behavior. Yang said that the practice is “one of the most effective ways to raise consciousness,” although he admitted his training methods may not be acceptable to everybody.